Also on Saturday night, New England folk artist Dar Williams is making her Carnegie Hall debut as part of the City Folk Live at Zankel Series. Then, on Sunday night, she’ll be trotting over to Brooklyn to play in a little less refined atmosphere at Park Slope’s Southpaw. 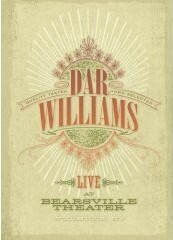 Dar also has a brand new DVD out now called Live at the Bearsville Theater (Razor and Tie), it’s available at fine stores everywhere.